118 Boats; 5. Friends of the Library. 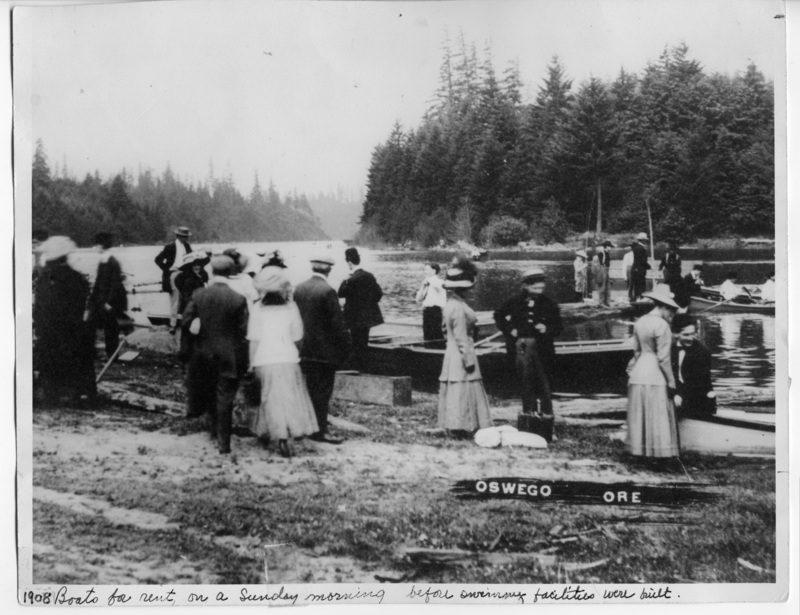 Lake Oswego 1908, Site of Bay Roc Apartments. 17A, 5 1/2 x 3 3/8. [label taped on back]: Nelson's Boat Landing. This picture taken in 1908 or 9 shows boating on the lake of that period. [address label]: Mrs. Robert Arneson North Shore Raod, Oswego, Oregon. Description View is of the East end of the Lake looking West; same as 54a. [written in ink on front]: 1908, Boats for rent on a Sunday morning before swimming facilities were built. [imprinted on front]: Oswego Ore. Transcription 118 Boats; 5. Friends of the Library. Lake Oswego 1908, Site of Bay Roc Apartments. 17A, 5 1/2 x 3 3/8. [label taped on back]: Nelson's Boat Landing. This picture taken in 1908 or 9 shows boating on the lake of that period. [address label]: Mrs. Robert Arneson North Shore Raod, Oswego, Oregon.